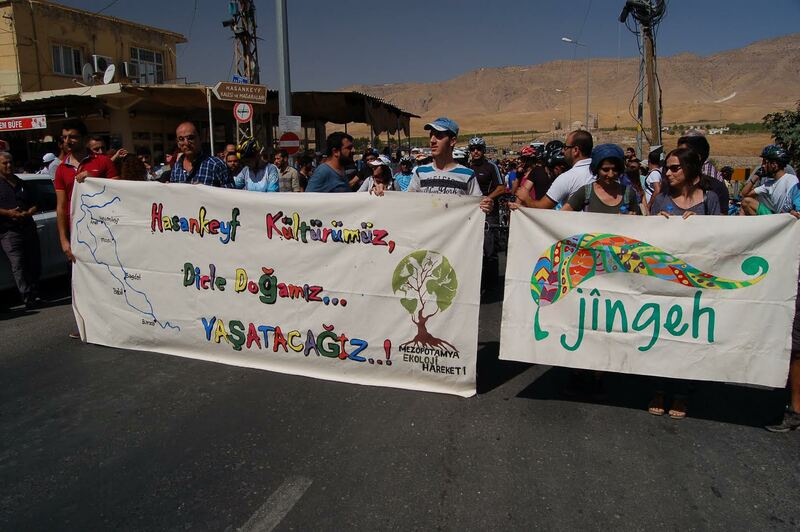 On the Global Hasankeyf Action Day in Hasankeyf and several cities hundreds of people have demonstrated against the expected destruction through the Ilisu Dam on the Tigris and for Hasankeyf. HASANKEYF: The biggest action was done in the 12.000 years old town of Hasankeyf at the Tigris River in Turkish Kurdistan today. Around 400 people gathered in the center of Hasankeyf, which is threatened by the Ilisu Dam, and blocked the central cross joint. Among the participants were among others ecological activists from neighbor provinces, 30 cyclists who in the morning drove with their bikes from Batman, two dozen international political activists. A higher would be achieved if not the day before in Batman 82 people – including the two co-mayors – would have been arrested. In the city center location a declaration was done to the public and the numerous journalists. In the speeches Hasankeyf has been considered as one of the main symbols of the regional diverse cultural heritage and the Tigris River as the source of life in the greater region. The destruction of both (and similar dam investment projects) equals for the affected people as threat to life of a whole region and as a weapon against the rebellious local population. Included also the increased political repression in Kurdistan, the population is more upset of the government. After the speeches the participants shouted “No to war and dams”, directly afterwards they did a march on the main road to the Zeynel Bey Tomb where dragons kites have raised to the air. The kites have been prepared for the children who have been killed in the last weeks in different Kurdish cities. A direct press release from Hasankeyf could not be done because the internet connection in the whole province has been cancelled by the government. 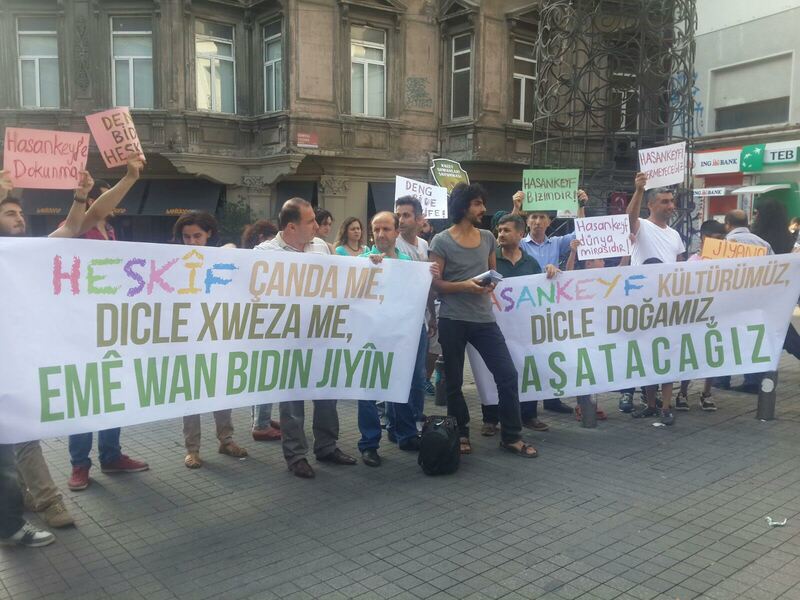 ISTANBUL: In Istanbul four ecological groups called for a meeting at the Istiklal street in the Beyoglu district within the Global Hasankeyf Action Day. 40 Activists and people from Hasankeyf working in Istanbul came together under the slogan “Hasankeyf is our culture, Tigris our nature; we will save both!” like in Hasankeyf. It was positive that there was a big press interest in this action. BAGHDAD: Two days ago, on the 18th of September, there was a demonstration by activists in Baghdad’s Tahrir Square against the Ilisu Dam. 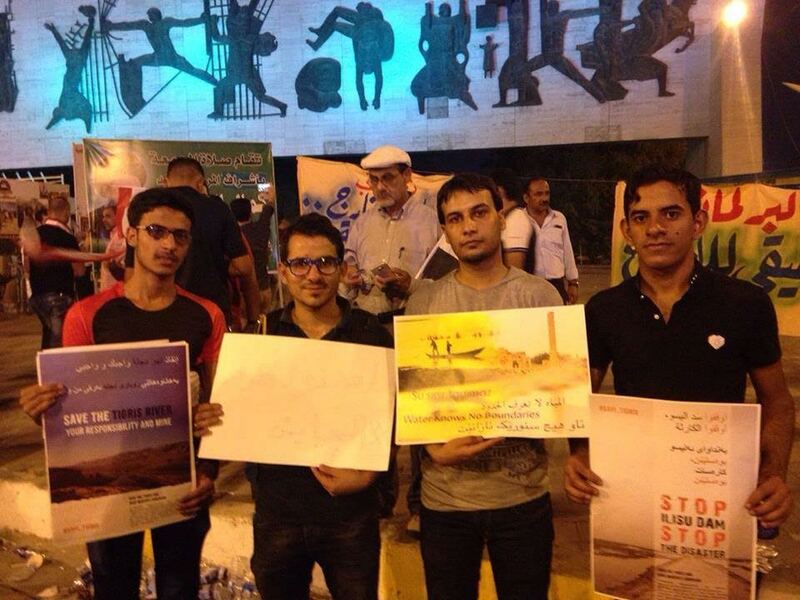 A group from the Save the Tigris and Iraqi Marshes Campaign have prepared the demonstrations with little number of demonstrators and less amounts of equipments like posters and support, but it flamed the street widely for the civilians. In the press and media there was a big interest where they have got more than nine press interviews.Firstly the activists send solidarity greetings to Hasankeyf and emphasized the engagement against environmental and thus social destruction; then criticized the upstream governments, particularly Turkey who cuts the water to Iraq on the Euphrates and Tigris for many years. The Ilisu Dam would the worst scenario for Iraq. Iraq is experiencing drought for many years, within Iraq the Marshes in the South are affected the strongest. The activists requested the stop of all dam constructions until there is a mutual agreement on international conventions. “The critic on the Iraqi government was stronger because it does not engage itself hardly against Turkey. Although there is a war, Iraq must think for its present. The behaviour of the Iraqi government is a shame” said the activist at the end of their protest. 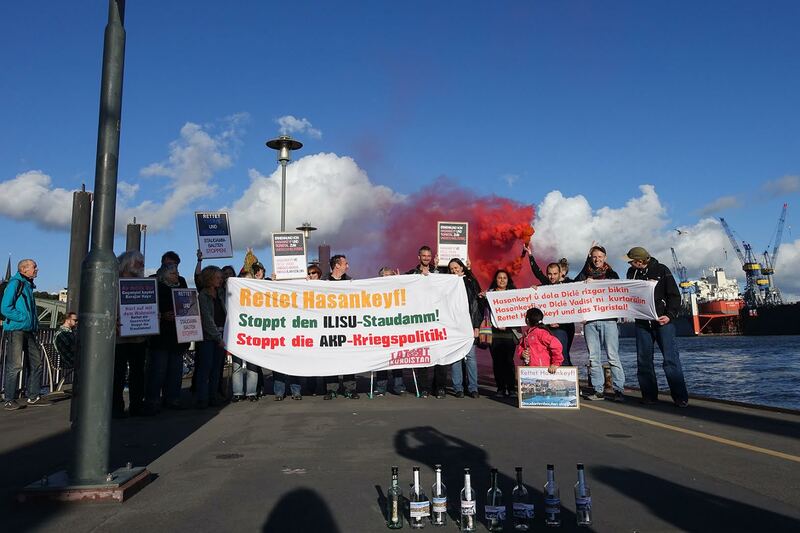 HAMBURG: Activists, who were involved in the campaign against the Ilisu dam from 2006 to 2010, have organized an action at the port of Hamburg. They put messages into bottles and sent it to Hasankeyf and the activists doing at the same time an action. In their declaration the activists mentioned the resistance against the huge destructive project Ilisu for more than 15 years and expressed hope to stop the dam.Both, the Mesopotamian Ecology Movement and the Initiative to Keep Hasankeyf Alive will continue with their struggle against the Ilisu Dam which will destroy the livelihoods of up to 80.000 people in 200 settlemens, destroy the unique Tigris River and flood the unique antique town Hasankeyf. This dam project is in no way acceptable for us.